The one thing that really got to me in this issue was how much Wolverine was acting out of character. Granted, Darla is responsible to some degree for the death of a mutant, the one who sent out a psychic cry to the X-Men for help in the first issue, but Wolverine’s reaction to her powers being revealed is grossly out of order. It gives a very dark touch to the proceedings here and I’m not certain whether or not I do appreciate where the story is heading now. With Darla’s powers going out of control bit by bit, even the X-Men begin fighting amongst themselves and given how personal Revel has made the story so far, I can’t help but feel a little distressed at the bleak turn that events have taken in this issue. The full force of the darkest memories of the X-Men are revealed here, and the characters really go all out on each other. And if two young mutants are caught up in the middle, then so be it. They’ve all had it coming, so to speak. But things don’t end there, exactly. We get to see a lot more of Krystal and Darla here, which was really good. We also get to see just what the hell is going on in this supposedly quiet town, and none of it is good. There is a madman at the heart of everything and it so happens that the madman is a apocalypse fanatic and a sort of religious nut as well. And he runs a drug operation, one which has a very, very dark source. I liked the interplay between Kitty and Krystal most of all. It was a heart-touching moment in the second half that really sold me on their story, and I loved how Revel teased it all out. Moments like those are why this comic is so good. But, the effect was somehow ruined by the whole bad blood thing that happened between Wolverine and Rogue. That gave me pause and I was just confused as to what was happening. Were Darla’s powers having some kind of a side-effect on the brain processes, making people even more irrational than usual? Fascinating for sure, but I would have liked to have seen some answers as well. On the art side of things, I’m quite disappointed. I like Revel’s pencils and Peter’s colours in the previous two issues, but for some reason I just couldn’t get into the art here. It often felt rushed and unfinished, as if there was a looming deadline and Revel had to finish the pencils off in a hurry. Often times the characters are just silhouettes and little more. Often times their expressions just aren’t there. And when things really go to town in the second half, all the different characters that are included just make it a confusing issue since you can’t be sure what’s what. But, the effects of the drug, those scenes were pretty good. A really trippy trip those panels, and certainly some of the highlights. The simplistic expressions on the face of the druglord were also just pure gold because, again, of the trippy nature. So that was a good thing. But just generally, I have to say that I didn’t really like this issue all that much, and that I would like to see something more substantial in the next couple issues. 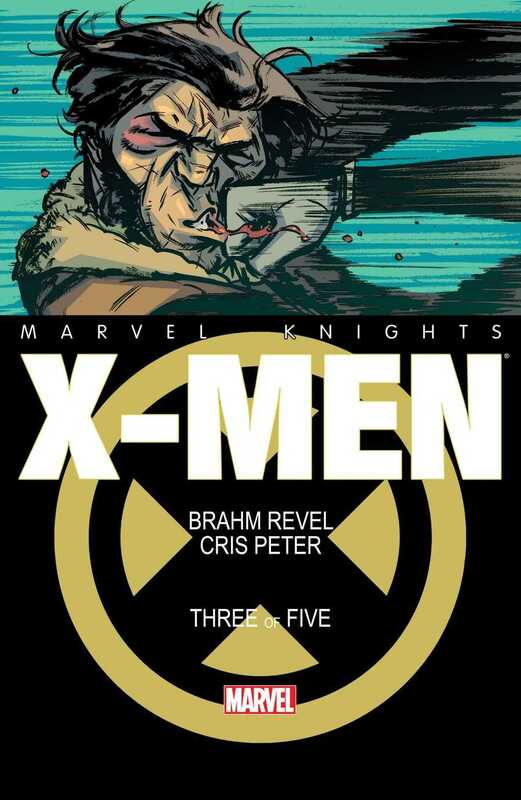 More Marvel Knights: X-Men: #1, #2. Posted on February 1, 2014, in Comics Reviews, Review Central and tagged Action, Blob, Brahm Revel, Christiane Peter, Comics Review, Cris Peter, Dreadnought, Drugs, Kitty Pryde, Marvel, Marvel Comics, Marvel Knights, Marvel Knights: X-Men, Mutants, Review, Review Central, Rogue, Superheroes, Supervillains, VC's Joe Sabino, Wolverine, X-Men. Bookmark the permalink. 1 Comment.